Wirths, O. (2017). Extraction of Soluble and Insoluble Protein Fractions from Mouse Brains and Spinal Cords. Bio-protocol 7(15): e2422. DOI: 10.21769/BioProtoc.2422. The current protocol details the preparation of soluble and insoluble protein lysates from mouse brain or spinal cord samples. In detail, tissue homogenization and sequential protein extraction are described. This procedure yields soluble and insoluble protein extracts that can be further processed in down-stream applications like ELISA or Western blotting. 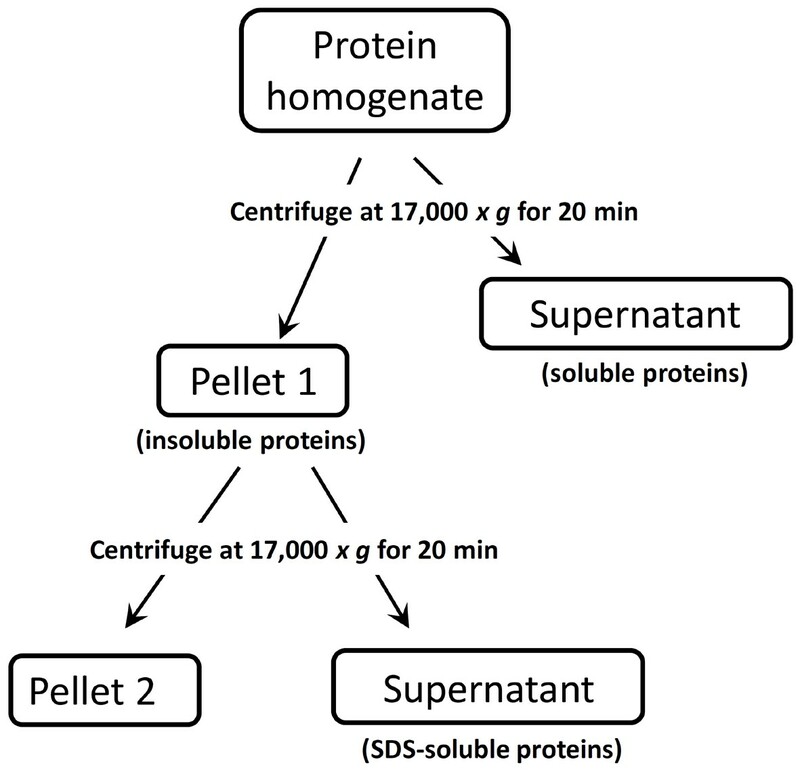 This simple and reproducible protocol of brain tissue protein fractionation details the initial separation of a total protein homogenate into a soluble and an insoluble fraction. It can also be applied also to other tissue samples and yields a soluble fraction containing hydrophilic proteins and an insoluble fraction consisting of more hydrophobic proteins. Following an initial homogenization in a lysis buffer containing no detergent, the supernatant including the soluble protein fraction is removed and the pellet containing the insoluble fraction can be further extracted using Sodium Dodecyl Sulfate (SDS) as detergent to ensure entire cell lysis (see Figure 1). This approach can facilitate the analysis of low-abundance proteins by reducing the complexity of the sample. The following protocol has been used to extract soluble and insoluble protein fractions from mouse brain and spinal cord samples from mouse models of Alzheimer’s disease (see Härtig et al. and Saul and Wirths ). The user might need to modify the amount of solutions (e.g., lysis buffer) depending on the particular downstream application (e.g., Western blotting or ELISA). For Western blots, we recommend using 20 to 50 µg of total protein per well. This procedure will yield soluble protein fractions with concentrations of approx. 2-4 µg/µl and SDS-soluble fractions of approx. 5-8 µg/µl. Depending on the initial tissue weight, protein amounts > 2 mg (soluble fraction) and > 4 mg (SDS-soluble fraction) will be usually achieved. For mouse brain and/or spinal cord preparation, animals were anesthetized by CO2 and sacrificed by cervical dislocation. Tissues were carefully dissected and either directly used or kept at -80 °C until further use. Mechanically homogenize fresh or deep-frozen brain or spinal cord tissue in a weight:volume ratio of 1:7 using cold lysis buffer (700 µl buffer per 100 mg tissue, see Recipes) with 10 strokes in glass-Teflon homogenizer (Figure 2) at 800 rpm (Figures 3A and 3B). The homogenate should have a milky appearance without visible particles. Note: Our lab uses one brain hemisphere with cerebellum and olfactory bulb removed and flash frozen on a plate of dry ice. We do not remove the meninges upon harvesting the tissue. Transfer the entire homogenate to 1.5 ml reaction tubes (Figure 3C). Spin the samples at 17,000 x g for 20 min at 4 °C. Note: Centrifuge should be pre-chilled to 4 °C. Remove the supernatant (soluble fraction) and store at -80 °C until further use (Figure 3D). Resuspend pellet 1 (Figure 3E) in either 800 µl (brain hemisphere) or 200 µl (spinal cord) 2% SDS (see Recipes) with a few short ultrasound pulses via sonication on ice. The pellet should dissolve upon this treatment (Figure 3F). Note: We use 5 short ultrasound pulses of approx. 1 sec length at level 2 in 1.5 ml reaction tubes. The clear SDS solution will turn turbid. Be careful to prevent foam formation. Add 1 µl of Benzonase, gently mix and incubate at room temperature for 5 min to remove DNA. Transfer the supernatant (insoluble fraction) to a fresh 1.5 ml reaction tube and store at -80 °C until further use (Figure 3G). Pellet 2 could be stored at -80 °C for further extraction using e.g., formic acid. Protein fractions obtained by this protocol can be further used in downstream applications like Western blot or enzyme-linked immunosorbent assays (ELISA) (for an example of potential further use in Western blots see Härtig et al., 2014; Saul and Wirths, 2017). Note: Can be stored at 4 °C for 1 month or at -20 °C for up to 3 months. Note: SDS consists of fine crystals that easily disperse. Wear a mask when weighing SDS and clean equipment thoroughly after use. Financial support from the Alzheimer Forschung Initiative e.V. is gratefully acknowledged. Härtig, W., Saul, A., Kacza, J., Grosche, J., Goldhammer, S., Michalski, D. and Wirths, O. (2014). 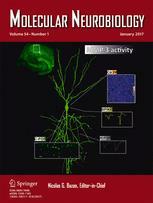 Immunolesion-induced loss of cholinergic projection neurones promotes β-amyloidosis and tau hyperphosphorylation in the hippocampus of triple-transgenic mice. Neuropathol Appl Neurobiol 40(2): 106-120. Saul, A. and Wirths, O. (2017). Endogenous apolipoprotein E (ApoE) fragmentation is linked to amyloid pathology in transgenic mouse models of Alzheimer's disease. Mol Neurobiol 54(1): 319-327. How to cite: Wirths, O. (2017). Extraction of Soluble and Insoluble Protein Fractions from Mouse Brains and Spinal Cords. Bio-protocol 7(15): e2422. DOI: 10.21769/BioProtoc.2422.